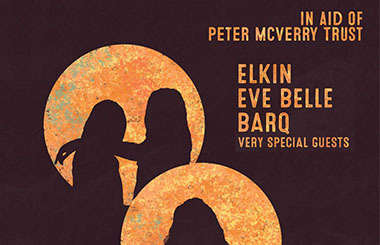 On the 23rd of January Elkin, Eve Belle & Barq will perform a special concert in aid of the Peter McVerry Trust. There will also be special guests attending the night. Donations can be made on the night. Fr Peter McVerry has been working with young people experiencing homelessness for more than 30 years. In 1974, Fr McVerry moved to Summerhill in Dublin’s north inner-city where he witnessed firsthand the problems of homelessness and deprivation. In 1979, he opened a small hostel to provide accommodation for homeless boys between the ages of 12-16. Four years later in 1983, he officially founded The Arrupe Society, a charity to provide housing and support for young people experiencing homelessness as a response to the growing numbers of individuals becoming homeless in Dublin and has since been a leading advocate for addressing the issue of homelessness in Ireland. Tickets to this gig are free of charge but is recommended to make a donation of €10 per ticket. ELKIN are already making waves on the Irish music scene after just one year as a four-piece. Their collaboration with Tebi Rex, ‘She Hated Love Songs II’, received praise from Dan Hegarty and Eoghan McDermott amongst others. Following the release of their debut single ‘Paro’, ELKIN were named as one of State.ie’s Faces of 2018 and performed at the Whelan’s Ones to Watch 2018 Festival in January. BARQ are a high energy four-piece, shoving groove into the belly of the rock-beast and creating agrosoul. This is music to dance dangerously to. In March 2016, BARQ released their debut single “Gentle Kind of Lies” to critical acclaim and a surge of media attention. The track was picked up by Spotify’s new music playlist in both the UK and Brazil. Since then, BARQ have been one of the most talked about bands in Ireland. Lead singer, Jess Kav, featured on the front cover of Ireland’s premier music magazine, Hot Press, and BARQ were included in The Irish Times “50 People to watch in 2017”. Whelan’s Silent Disco, now every Mon, Tue & Wed from 11pm – 2 DJs, just pick the one you like best [Free Entry] plus Late Bar.